Waitress was cleaning out our summerhouse where we like to hang out in various hayboxes, the dog bed, my man cave and Katrijn’s boudoir. We had made our usual sterling contribution by filling our extra large litter tray – it fetches a high price in the Bunnington Post Bespoke Fertiliser Shop. It is very satisfactory to see that it takes our staff 45 minutes to make our home presentable again. We like to help them (read: supervise their hapless efforts at interior design). Waitress thought she was clever by letting me and my Katrijn have the run of the garden. Thought it would distract us enough to go slack on the supervision! Well, it did, I have to give it to her. While she was busy weighing up and bagging our precious produce for sale and installing stylish new hayboxes, Katrijn and I romped around the garden in the weak winter sunshine. Now, this garden is new to us and full of unknown stuff, so we have a lot of work to do. We also know it worries our staff because various things grow in this garden that do not agree with us, delicate creatures that we are. Anyway, me and Katrijn were having an excellent time doing laps and chinning things while occasionally running into the summerhouse to pay waitress a surprise visit. Appearing when they least expect it does wonders for standards in service delivery. Katrijn enjoys lawns in particular, because of the low risk of mane-entanglement while bunsploring. She’ll join me in flowerbeds and likes me to clear the way for her first. Of course, being the gentlebun here I am very happy to oblige. 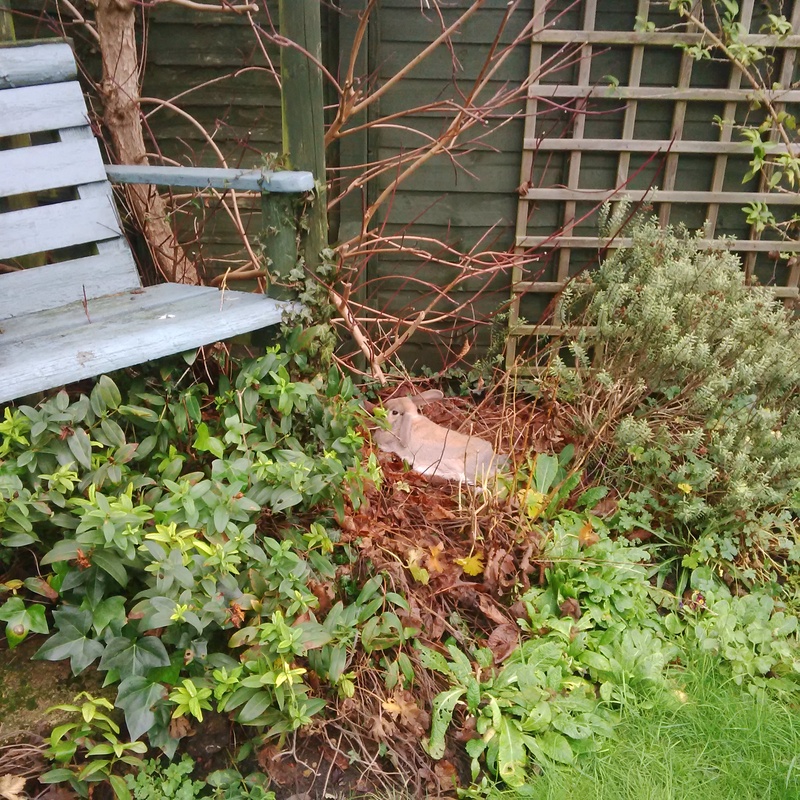 I was making some excellent progress chewing through vines and and twigs underneath the blue corner seat, which Katrijn and I have chosen for our summer love nest, when I noticed waitress wearing her concerned expression. I immediately lay down and started panting. She frowned. She looked at me for a while and walked off again. I upped my game, and crawled under the blue seat where I lay down again to repeat my performance. I added some extra drama by crawling and turning on my belly and stretching out in my hideout for about 15 minutes. All this was a bit wet and mushy of course but a small price to pay; besides, I’d been doing the Bunny 500 just minutes before so I was kinda hot and bothered anyway. Now waitress was truly shaken. She mumbled something about evergreens, delphiniums and nightshades, and then she took the bait: she got on her knees and picked me up from my little nest, just as it was getting nice and warm. She put me down in a very fragrant, fresh hay box. I decided to play one more trick on her. I refused a treat she waved under my nose. Now she galloped off into the house where I could see her looking for the telephone. She was going to ring the VET. That’s when I decided it was time to draw a line under my prank. Nobody messes with a vet. I ran outside and started chasing Katrijn. We invaded Bouffe’s favourite flowerbed. Waitress came into the garden, looking astonished. We mobbed her for treats. Well, I think it wasn’t very nice of Haas to scare the poor waitress like that. She does so much for you (think of that nice clean hay box filled with delicious hay). I think you should eat double treats to make amends. We have been very good since yesterday to make up for it! Waitress says she has recovered from the scare and we have allowed her an extended cuddle session as a reward. All is well!